One of the most embarrassing things you can do on social media for your business is to mess up a post. For some of us, that might be a spelling or grammar mistake, for others, it may involve a humiliating auto-correct situation. For others still, it might mean giving away a company secret earlier than intended. 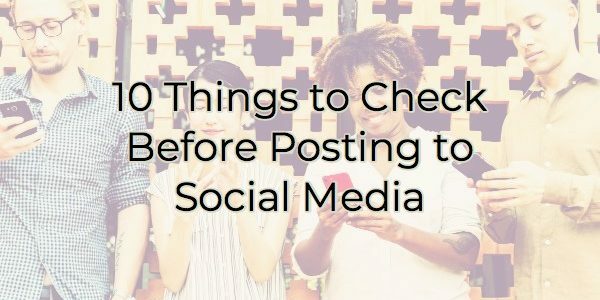 Whatever it is that you’ve done or might do, you can ensure it doesn’t happen again with this handy social media post checklist. Very little can be taken back on social media. A mistake in a post can be embarrassing or deeply troubling to your PR department. It can alienate customers or cause them to question your professionalism. Before hitting send, post, or tweet, run your potential post through this handy checklist. Proofread before sending to avoid silly mistakes. We all love spell check but it’s not always enough. Spell check doesn’t always catch homonyms (words that sound alike but are spelled differently) and depending on your settings, it may not catch a misspelled word if you have it in caps or it is capitalized. Don’t forget to double-check auto-correct issues, especially when sending from your phone. However, never blame autocorrect for your mistakes as it usually only corrects your words with frequently used ones. Be funny, not offensive. Humor is great but not if it alienates customers, vendors, or partners. You can lose lucrative relationships over something as simple as a tweet. You’d be surprised how few second chances are given on social media. Use sarcasm sparingly and obviously. Are you saying what you mean? What is your tone conveying? Is that the only way it could be interpreted? Sarcasm is very difficult to master in print or on social media. Just look at Jonathan Swift’s A Modest Proposal where he <satirically> suggested eating children in order to solve the problems of famine and poverty in the early 1700s. Many believed his idea to be a serious proposal. It is much better to use the strong words you mean than to post something in jest. Meaning can be lost in social media unless you accompany it with some emotional clues like emojis. Check stats and claims. If you’re quoting a source make sure you haven’t transposed numbers or wrongly attributed a claim. Ensure you use a “not” if that’s what you mean. After all, there’s a big difference between 3 billion and .3 million as well as 83% of adults are on Facebook or 83% of adults aren’t on Facebook. There are also a lot of people on social media who enjoy correcting people. Test the link. Always check your link by copying it into another tab and double-checking that it works. When you’re copying and pasting, it’s easy to copy and paste the wrong one or leave off the last character so checking is always advisable. Double check the image. When you’re using an image from elsewhere, wherever possible give attribution through a tag. Not only is it the polite thing to do, but it can help your business. It will call attention to your post and the original content creator will be made aware of you. They may even share your post. Even if you decide not to tag the original content creator, watch for watermarks. If there is one or you’re reposting something that’s been shared by multiple sharers, go to the original site mentioned in the post before you share it. You don’t want to share content that one of your followers could follow back to the original poster only to find it’s an unsavory group. Use scheduling software. If you use scheduling software, you’re not going live immediately. We all know there’s something inexplicable about posting. Your post looks perfect until you hit the post button then magically all of the errors are visible. (At least that’s how it seems.) If you use a scheduler instead of going live immediately, you’re creating a buffer that will help you see mistakes before they’re in someone’s stream. Many schedulers also have spell-check features. Use with permission. If you’re posting to social media, always use attributes for quotes and materials. Give the content creator credit for saying/writing it in the first place. That’s common courtesy. However, this becomes much more important when your posting is posting to a blog and not merely a quote. If you’re using a cartoon, song lyrics, more than 10% of a printed work, or an image, and you’re publishing it on a business blog, you should seriously consider getting permission from the content owner. If your usage is for educational purposes, the rights holder may be more lenient. But if you stand to make money off of it, don’t be surprised to receive a cease and desist letter. Grammar rules have become less enforced with social media. Copyright law has not. Look at the published post. After you post your item, always double-check it again. Click on the links. Take another look at the spelling and grammar. Some social media platforms (like Facebook) allow you to edit your posts so you could save yourself some issues if you’re the one who catches it. Finally, if after all of this checking something still escapes your attention and causes someone dismay, remedy the situation quickly. If it’s grammar thank them for their attention to detail and get it corrected. If it’s a public relations issue, consult the appropriate decision maker about how it should be handled. Remember, doing so quickly is your best course of action. That’s why so many businesses have a protocol in place on how to handle a social media faux pas. If you don’t, you should consider making those decisions ahead of needing them. Get to know more about our chamber staff and the skills they bring to our chamber. Our team has depth and breadth of experience that they bring to our members and our chamber programs. Learn more on our updated staff bio page! Surveys aren’t the way to good customer service. They might’ve been five years ago, but they’re being used with such an annoying regularity that no one wants to take part in them. But how do you improve your business’ customer service if you don’t know what your customers want? Trust us. There are other ways. 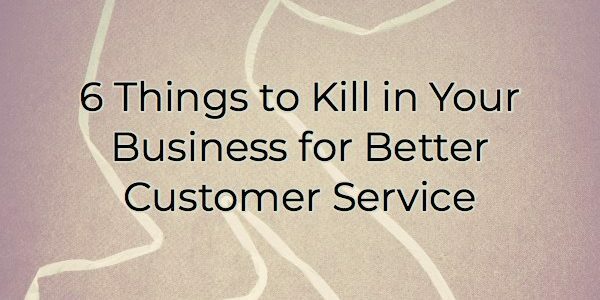 Here are a few things you need to ditch in order to begin providing better service. As I just mentioned, surveys are overdone in 2018. Call the bank, they send a survey. Get the oil changed in your car, survey. Everything is a survey these days. Sure, you can get people to participate through free goods and discounts but no one wants to waste time telling you how to do your job. Try this instead: try one-question, emoji-style ratings when you send a follow-up email thanking them for their business. Smiley face or sad face. Or use a clickable star rating the way Amazon or Goodreads does on their reviews. Then give them contact information to a real person if they have more to say. They can rate you in a second as well as ask for a follow-up. When an employee leaves, there’s a time before you hire again while you’re searching for an ideal candidate. If that process becomes long and drawn out, co-workers are usually called upon to fill in the gaps. After this occurs for a while, management often thinks that position doesn’t need to be filled since everyone is managing fine. Unless you are making it worth the employees’ while financially, you are over-burdening the employee. Burnt out employees don’t provide good customer service, let alone excellent service. Try this instead: as soon as the employee gives notice, begin the hiring process. As a preemptive solution, always have up-to-date job descriptions on file so there’s no time wasted writing them. Ask good employees for referrals. Fill that position or compensate the individuals who are taking on an increased workload. Everyone working for you should know two things: what’s expected of them (including how they’re measured against those expectations) and how you expect the customer to be treated.If they don’t know these things, it’s difficult to do their job. Try this: Give employees processes and missions to go by so it is clear to them to what degree your company believes the customer is always right. This empowers them to do right by the customer on a level that you support, even if you’re not available to ask. If your employees are always making up excuses as to why something didn’t happen or why they’re not meeting expectations, your customers will grow tired of this. Customers recognize an excuse. Excuses never smooth over any of the ruffled feathers. Try this: Ban certain language from your employees’ repertoire. Things like, “I’m new” or “That happened because X is new” don’t matter to customers. They don’t want an excuse. They want a solution. Make sure your employees are skilled at providing them. Yes, protocols are essential to businesses operations but you also want your employees to be creative problem solvers. They should not feel hemmed in by rules that can never be bent. Sometimes, it is necessary to make allowances. Try this: as mentioned earlier, let employees know how far they can go to do right by the customer. It’s important they feel empowered to act on the customer’s behalf. The customer doesn’t care whose job it is. When they have a problem, they want it handled. There’s nothing more frustrating than an underling saying they can’t do anything or the customer being passed around the company explaining the issue each time. Try this instead: even if the person answering the inquiry isn’t fully equipped to solve the issue, they should remain the main point of contact for the customer. The employee is the one who works for the company. They are the most skilled at dealing with peers and departments. Stay in good communication with the customer and allow one point person for customer convenience and relationship building. This way your customer will see them as an advocate for them. If you want to start providing better customer service, think of the customer experience. Consider the things that bother you most about dealing with businesses. Then refrain from introducing those frustrations into your environment.